Lace Them Up! Get Out There! You can run, but you can no longer hide. Regardless if you are a business, faith-based, community-based or individual, if you don’t have an online presence you are missing the mark. Your online presence is even more critical now than ever before with 3.7 billion consumers using the Internet as a resource for information. Some even say it is their primary resource. They live or die by what they read or hear on the Internet. If you have not included it into your marketing strategy or you are still on the sidelines afraid to lace up shoes and get in, you are already far behind the game. The evolution of online marketing and having an online presence is only increasing moment-by-moment. If you want to play, lace up those shoes and get into the game. One of my sisters is petrified of the Internet. Her shoes are still unlaced…actually she hasn’t even put the shoestrings in yet. It is almost comical how she feels that it has this supernatural power over her. Many of you feel the same way. Don’t be afraid of it. Truly it is not big as you, but it definitely can help you be big. The beauty of it all is that it doesn’t have to cost you an enormous amount of money, in some instances you don’t have to spend a dime, just your time. Post consistently. Be careful not to be overbearing. You must be consistent with posting. You can’t do it today and then wait a month, week or a few days and do it again. Your goal is to build up a following. You need evangelists to carry your message far and wide. Be consistent so your evangelists can help you spread the message. Create a schedule incorporating each of your social media platforms in leveraging your content. Target your posts. Every post should be targeted to your target audience on all the social media platforms you use like Facebook, Google Plus, Twitter, LinkedIn, Instagram and Pinterest. If you don’t know who your target audience is, you need to take some time and figure it out. It is useless posting and you don’t know who you are trying to reach. If you don’t know how, seek assistance to help you with your market segmentation. Manage your posts. Tools like Hootsuite and Buffer can help you manage your content and share even when you are busy, for little to no cost. You can set it up with scheduled posts to each of your social media platforms all in one swoop. Your content can post immediately, or you can schedule it as far as six months in advance. You want to work smarter and not harder. As you grow, you may want to invest in expanding those services. Each of them offers free usage with limited capabilities. That can be enough for you in the beginning. I’ve come to realize that it takes ingenuity, courage, confidence and just plain ole get to it-ness for you to be successful. It’s in the mix. No one will stay engaged to anything if they get the same boring thing every time. Mix it up. With YouTube, Periscope, Facebook Live and more, you don’t have to put the same content out there every time. Learn how to repurpose your content from a blog post, to an email, to a podcast, to a Periscope or Facebook Live stream and more. Your content should not just be words, but pictures, videos etc. Be creative with your posting, but make sure your graphics are high quality and aesthetically appealing. You don’t want to look amateurish; and you don’t have to look amateurish. There are enough sites out there like Canva and Fiverr where you don’t have to unless you want to, or you’re just too lazy and don’t care. Consider the source. You are only one source, but there are myriad sources to draw from. Include your content, others’ content, business related posts, quotes and other topics to capture the attention of your audience. You have to cultivate relationships with others and share their information. It is a quid pro quo hook-up. You help them and they will help you. You can only reach so many people, but with the help of others you can reach even more and help them do the same. Be creative…show off your personality. People get bored with just seeing stuff about your business, let your personality burst forth. Humanize yourself. Give insight into who you are and your brand. Because you are your brand. Act like a 2-year old! Have fun with it while providing invaluable information that keeps them coming back, becoming an evangelist for you and even more, become a loyal and committed consumer for your product or service. Got it! Don’t trip over your shoe laces any more. Lace them up. 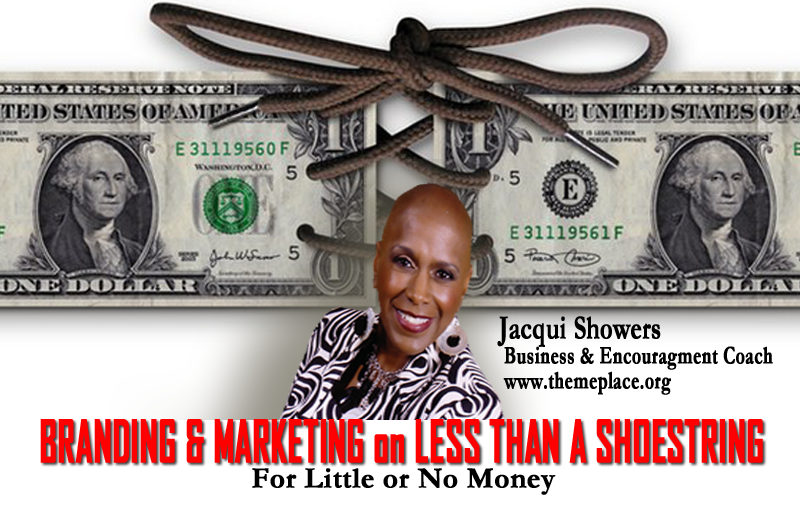 Get out there and brand and market on a shoestring budget with little to no money. Lace them up, but with little to no money. Take advantage of our complimentary coaching session to learn about strategies to brand and market on less than a shoestring budget. We’ll devise a unique program just for you and your brand. Sign up now!